MADISON – The Country School was delighted to welcome world-renowned Egyptologist Kent Weeks to campus recently to discuss his groundbreaking work in the Valley of the Kings. In addition to sharing stories about his efforts to excavate and catalog ancient Egyptian monuments, Dr. Weeks spoke about the library he founded in Luxor to support archeological research, educate local children about the importance of preserving Egypt’s monuments, and provide a community gathering place. More than 200 people attended Dr. Weeks’ lecture. Along with all Country School students and teachers, visitors included students and teachers from Madison’s Brown Middle School and Country School alumni, parents, grandparents and friends. 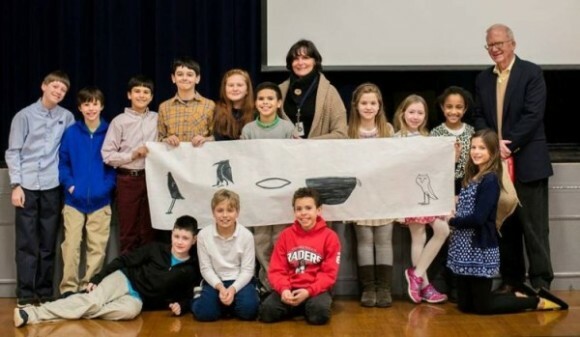 Dr. Weeks’ visit was a particular thrill for Country School fifth graders, who are currently immersed in a multi-month study of ancient Egypt — an undertaking that will culminate this spring with a visit to the Egyptian wing of the Metropolitan Museum of Art. As a class, students have read, discussed and watched videos about Dr. Weeks and his work with the Theban Mapping Project, through which he is setting out to catalog the thousands of tombs and temples in the Valley of the Kings and the Valley of the Queens. They also know details of his major find – the discovery of KV5, the tomb of the sons of Ramses II. During his talk, Dr. Weeks explained that resources for schools in Luxor are very scant, so the nonprofit Theban Mapping Project Library is filling a critical role in teaching local children about their heritage. Although researching, cataloguing and protecting Egypt’s monuments have been his life’s work, Dr. Weeks said the library may be the most important contribution of all. Country School students have been holding a series of fundraisers to support Dr. Weeks’ library, and after his visit they were able to donate $350 to benefit the Theban Mapping Project Library. They look forward to holding additional fundraising initiatives, including an ongoing student-run pop-up Farmers Market. Founded in 1955, The Country School is a coeducational, independent PreSchool-Grade 8 school in Madison. The school regularly invites speakers to campus to talk with students and/or parents about topics of interest and importance. The next event will be held on Thursday, Feb. 4, when the school hosts a screening of Most Likely to Succeed, the acclaimed documentary about the future of education. A panel discussion will take place following the screening, featuring Madison Superintendent of Schools Tom Scarice, Executive Director of the Connecticut Association of Independent Schools Douglas Lyons, and education writer Laura Pappano, author of Inside School Turnarounds: Urgent Hopes, Unfolding Stories and a frequent contributor to The New York Times Education Life, among other publications. The screening is free and open to the public. The Country School will also have a series of speakers on campus this spring when, on April 23, the school hosts TEDxTheCountrySchool. For more information about these and other events, visit www.thecountryschool.org.